Play is critical to every aspect of a healthy child’s development – laying the foundation for reading, writing, mathematical reasoning, creativity and a general love for life and learning. Getting your child ready for the learning environment is no different – let your child play their way to success with the following programs and resources. 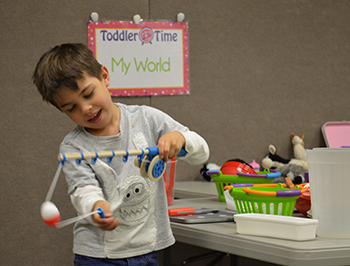 Our weekly program – an adult/child play-based program that incorporates music, movement, language, science and art. Have fun while preparing your child for school! Ages 3 – 4. For your youngest ones, checkout our fun-filled, play-based program where both adult and child can explore, create and discover together! Ages 15 – 36 months. Bring your child to one of our Story Times and join together in exploring new cultures and languages, making scientific discoveries and helping tell the stories yourself! Not sure what behaviors or skills to expect from your child each passing year? Check out the Early Learning and Development Guidelines for Washington State to learn more. Preparing your child for Kindergarten? Read some easy tips shared by the teachers themselves! Did you know that everyday interactions with your child can be turned into important brain building moments? Download the free VROOM app and see how these brief moments can add up to a lasting difference. 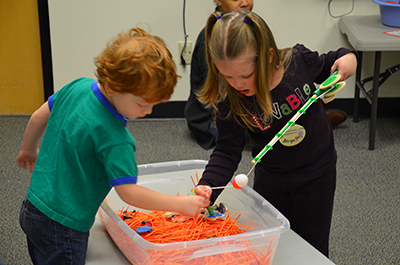 Think STEM (science, technology, engineering and math) is just for the big kids? Think again! Read how important and easy it is to start your little one thinking STEM from day one. Start your child off right with a daily math problem designed just for them. Download the free Bedtime Math app to see just how fun math can be.